A few days ago I spotted this one at Amazon. It looked just like the Cult Gaia Arc bag except it had one big advantage, a really pretty insert that fit inside to hold all your stuff. Plus, it was only 39.99! What??? That did it, I knew I had to give it a try at that price! When I ordered, I had a hard time choosing which bag to go with because I loved two of the three insert designs offered with the bag, and they don’t sell the inserts separately. The third insert features hummingbirds against a black background. The blue striped one with lemons reminded me so much of my visit to Isle of Capri back in 2015. I finally decided on the one above with the palm fronds because I thought the colors would go a bit better with my current wardrobe. I still love the Isle of Capri one, though! 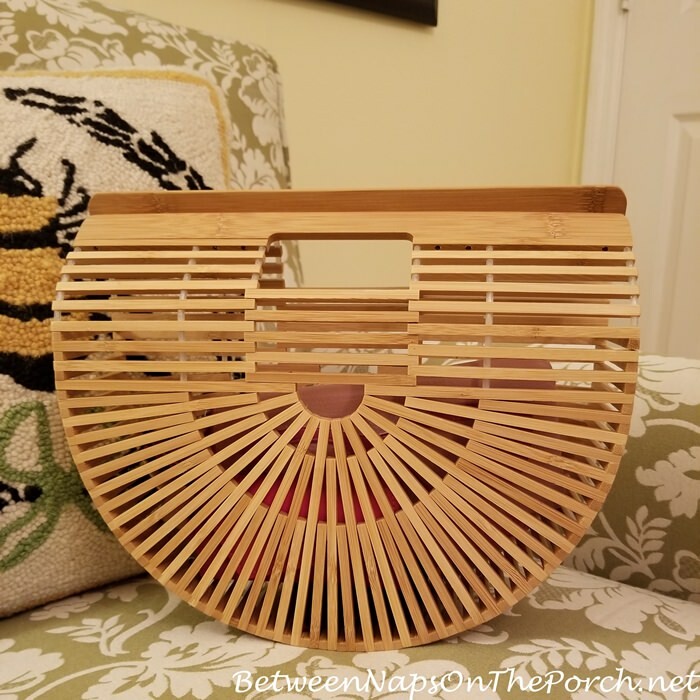 To view the bag, read the reviews and see the three insert bags, you’ll find this bag available here: Arc Bamboo Bag. The bag was delivered yesterday and it exceeds my expectations. I was grinning ear-to-ear as I took it out and realized how really nice it was! Don’t you love it when that happens, when something actually exceeds your expectations! I’m so impressed with the quality of the bag insert! It’s well-padded, heavy-duty, appears to be liquid proof and feels so nice in the hand. It doesn’t feel or look cheap at all, it’s so much nicer than I had expected! This bag also holds more than I had expected. It will hold everything below (plus my huge Samsung Galaxy Note 8 phone that I was using to take this photo) and it still wasn’t full! I should have probably added more stuff to see how much would fit, but I don’t really carry that much in my bags. Here’s how the bag looks with the insert inside. And here’s how it looks just tossing everything inside (except my big phone) without using the bag insert. I was surprised that you can’t really tell what’s inside even when not using the bag insert. Plus, you have a bit more room when not using the bag insert, so you can fit even more in. I still think I prefer using the bag insert, though. It protects things from hitting up against the bamboo which could be a bit rough on a leather card holder or leather key holder. I have to tell you, I am taken with this adorable bag. I love its uniqueness and its tropical “I’m on vacation” feel. 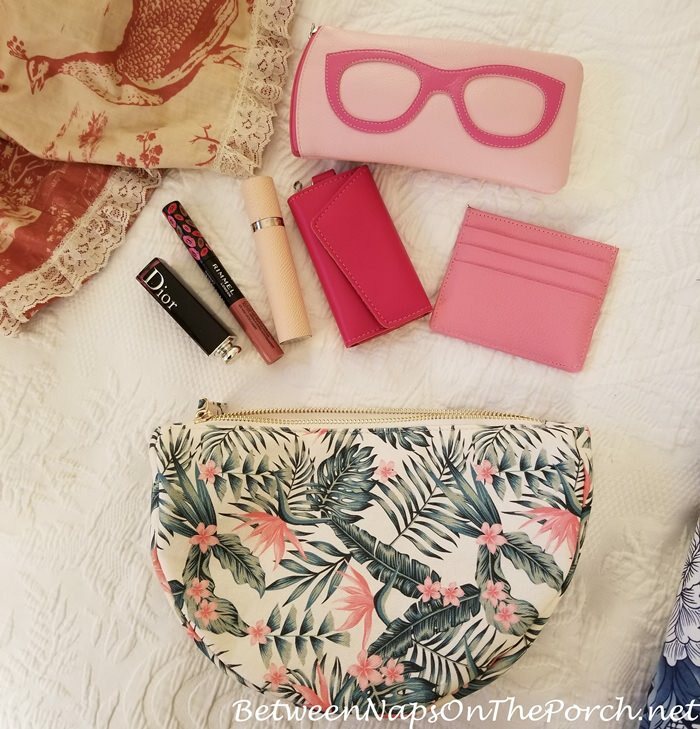 It’s not the kind of bag I would probably take to the grocery store or out for running errands, I prefer a crossbody bag for that, but I would totally carry it during the spring/summer when going out to dinner, to meet friends or to a party, especially an outdoor party like a cookout or a pool party. Just for fun today I decided to see how it would look with some of my favorite summer dresses. Since it’s not a crossbody or shoulder bag, I tied a piece of yarn around it to hang it on my dress form. 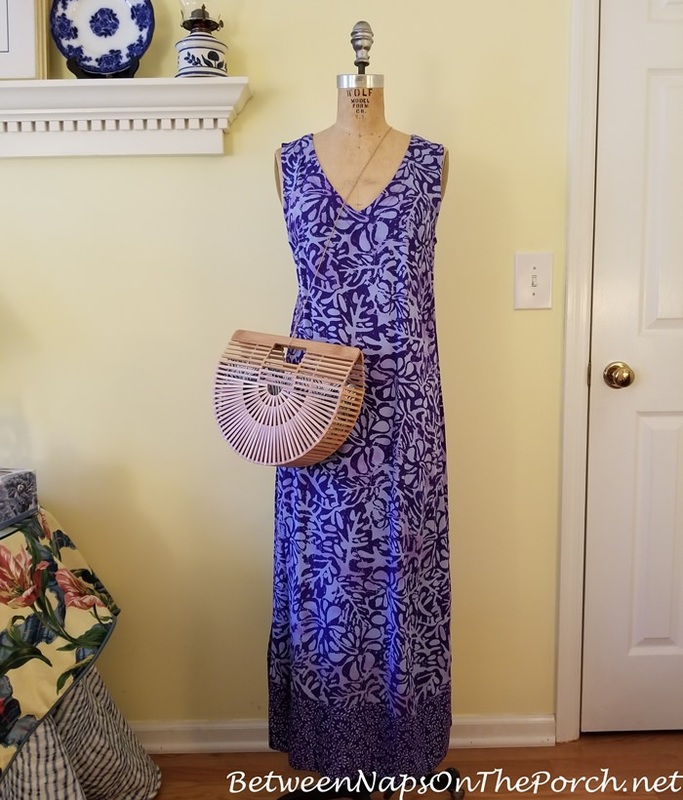 I’m so glad I purchased this vintage dress form over 25 years ago, it sure comes in handy for sharing outfit ideas in posts. 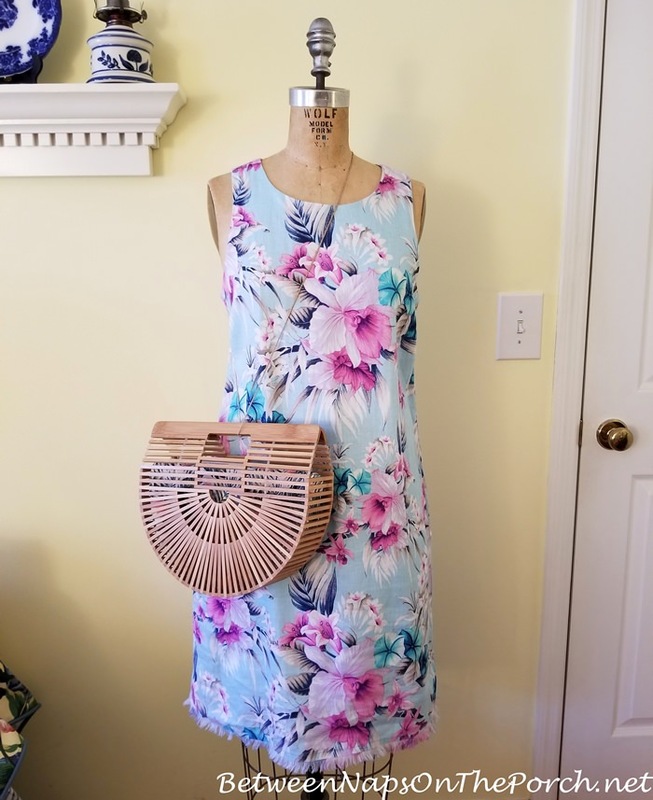 At first, I paired the bag with a maxi dress I purchased during my trip to Maui last summer, the one you guys talked me into taking when a friend offered me his reservation for free since he couldn’t go. It looks bigger in these photos than it is, it’s really a nice “medium” size bag…not too big and not too small. I love the contrast of the bamboo against the bright color of the dress! Wish I’d had this bag during my trip to Hawaii! Here’s how it looks with the other dress I bought on the Hawaii trip. Soo cute! I wondered how it would look with the shorter Tommy Bahama dresses I purchased while in Hawaii? I love it with those, too! It really goes with anything summery. I think it would look great with shorts or slacks, as well. 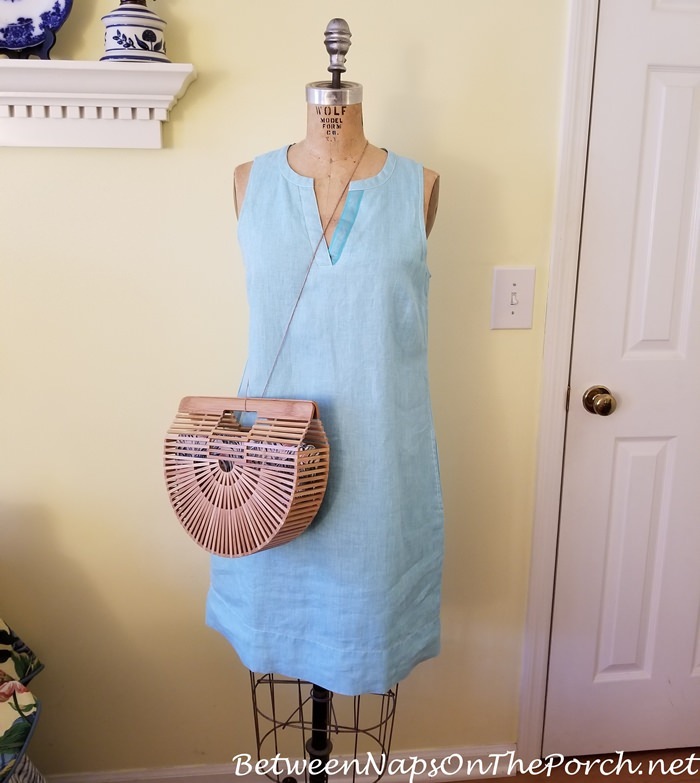 (This dress is currently available here: Linen Shift Dress. 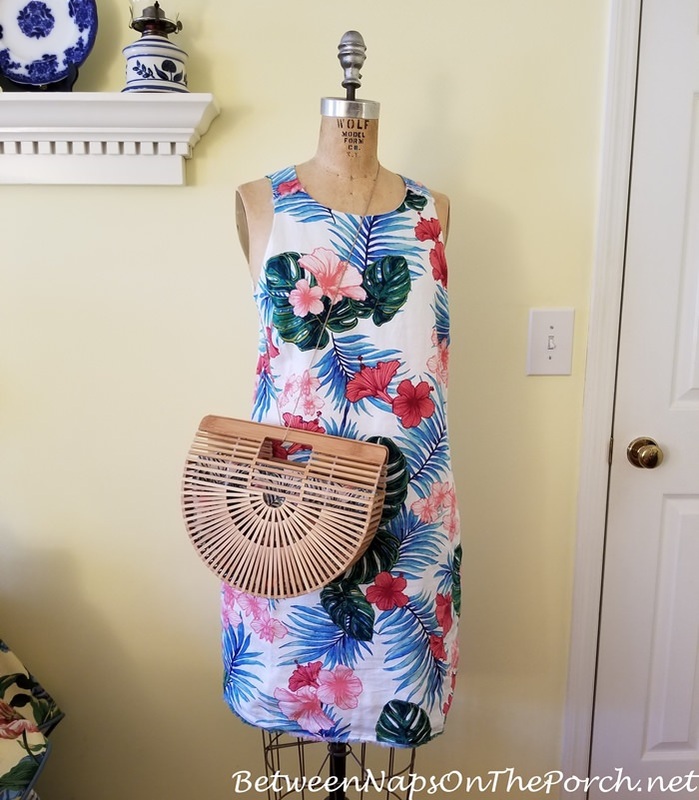 Here’s how it looks with the Tommy Bahama dress I bought recently during a big sale at the Tommy Bahama website. I really love their linen shift dresses because they are so cool for summer and the perfect length…not too short. 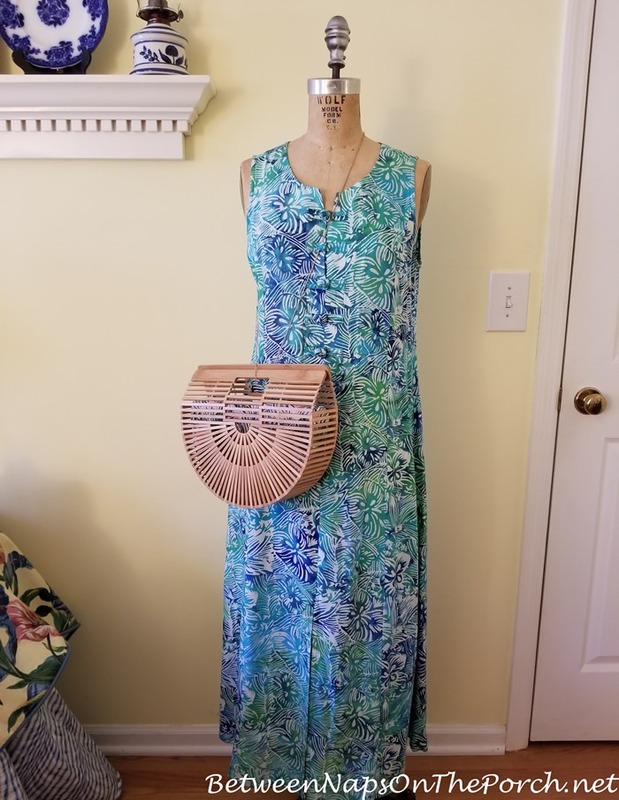 You’ll find Tommy Bahama’s current selection of summer dresses, including their linen shift dresses, here: Tommy Bahama Summer Dresses. I am so smitten by this cute bag, I started wondering how it would compare to the real thing…a real Cult Gaia bag. 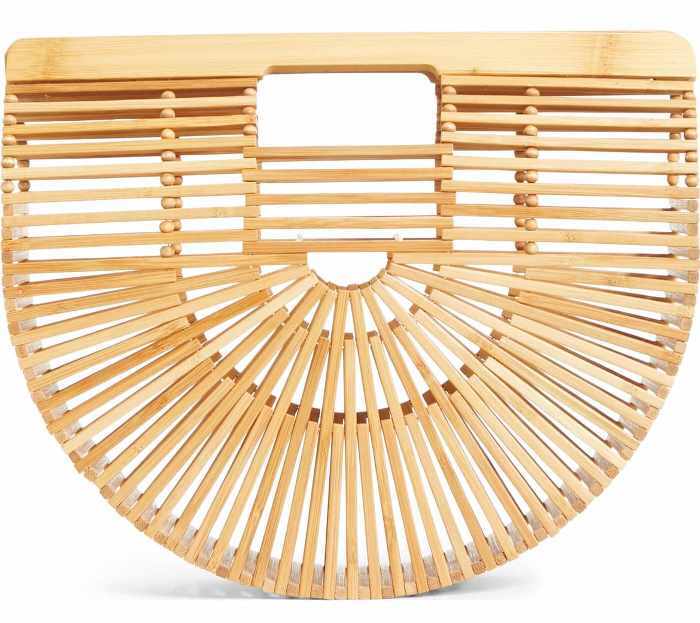 Note: I read somewhere that Cult Gaia didn’t invent this style bamboo bag, it appears these bags were super popular many, many years ago. I’ve run across several folks on YouTube who remembered having them back in the day. So apparently, Cult Gaia brought them back and made them famous. Anyone remember having a similar bag when you were in high school or college? Wanting to compare my bag to an actual Cult Gaia bag, I looked for some photos online and quickly became confused. The photos I kept seeing at Nordstrom and other stores online showed little beads covering the supports thingies inside the bag. See the small round beads going up vertically inside and on the edges of the bag. My bag doesn’t have those little beads and I don’t remember seeing them on the CG bags I had seen online. I went back and watched some of the fashion videos I had previously watched online featuring the Cult Gaia Arc bag and those bags didn’t have the beads either. So confused! 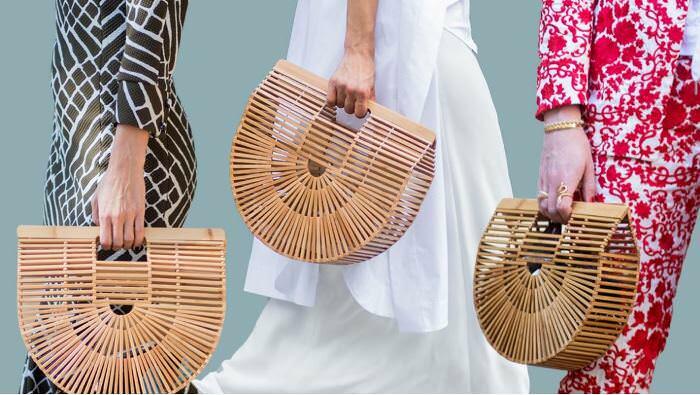 Next, I visited the actual Cult Gaia website and noticed that the arc bamboo bags they are selling do have the beads, but I did come across one photo on their site showing their bag without beads. In the photo below from Cult Gaia’s website, the bags on the right and left have the round beads but the bag in the center of the photo does not. It’s constructed more like the bag I purchased on Amazon. By the way, the Cult Gaia bags come in several different sizes. Here’s a close-up…see the nylon (or whatever it is) running up through the bag in the center and on the edges? There are no beads covering or hiding those supports. So I’m guessing they used to make their bags without any beads covering up the little support parts of the bag, similar to what you see in my current bag. My curiosity got the better of me, so last night I ordered the Cult Gaia Arc Bag from Nordstrom so I could see it in person. I ordered the same size as the bag I just recently purchased. 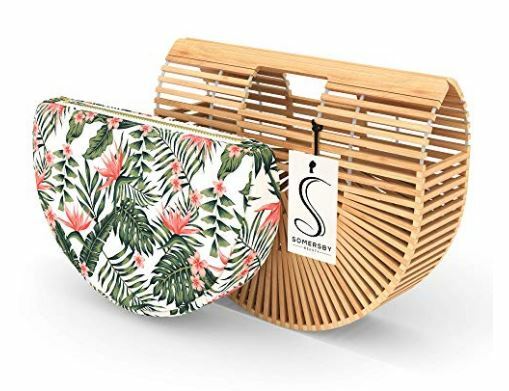 I don’t think the beads will make a big enough difference that I will end up keeping it since it costs $148 and the bamboo arc bag I purchased on Amazon was only $39.99, but I am so taken with this cute bag, I really want to see if the CG bag is worth the extra $$$. Maybe the beads will sway me. In either case, I’m not returning the bag I purchased from Amazon. Even if the Cult Gaia bag with beads steals my heart, I still want to keep and use the insert that came with my current bamboo arc bag. 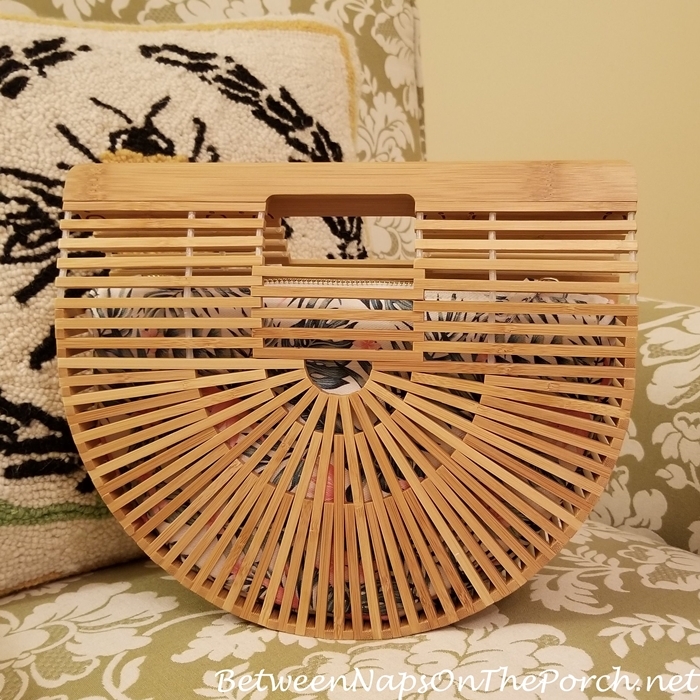 If you would like to read the reviews for this bag, you’ll find it here: Bamboo Arc Bag. So far, there are 71 reviews with 90% rating it 5-star, so it has quite the fan base. For the Cult Gaia bag with beads that I purchased in the same size, you’ll find it here: Cult Gaia Bamboo Arc Bag. You’ll find it in other size at that site, as well. I’m looking forward to comparing them side by side when the CG bag arrives this Friday. Do you have the Cult Gaia bag or a similar bag? These bamboo bags were originally a Japanese design and were often sold to Hawaiian tourists. They were sold from the late 1950’s thru the 1970’s. My mother and aunt both had one of these bags. They always lined them with a small colorful scarf. The beads helped reinforce the threads since the threads often broke from continued use. That is why most women lined them with scarves. My mom only used hers for special beach outings. My aunt never used hers and gave it to me to play with. I kept my Barbie and her bathing suits in it and and proudly carried it when we went to the beach. Ahhh, that must be the first time that were so popular. This one feels really sturdy. It’s not held together with thread but something much thicker and denser. Everything feels really solid, guess they’ve improved on the original design. What a great memory, Nancy! I love that! I can just imagine your bag filled with your Barbie and her bathing suits…so cute! It is such a cute bag! I think my mom had one when I was little. It seeems so familiar. I love how your bag goes with all of your dresses! Both of the bags are really nice. I like the one with the little balls in between. But I too like the inserts. Thanks, Arell! I love how things come back around again. I never remember seeing these, missed them the first time. Susan, just this weekend I looked at a straw bag/purse. I am so glad you shared this one as it is much more affordable. I have ordered this with the palm insert. Wish they offered separate inserts to change up with outfits. I also took your advice and ordered multiples of the storage bags for purses. My closet top shelf looks really nice with my bags displayed. It’s great to see what you have. Thanks for sharing your ideas and finds with us! The bag insert is a great improvement. I had one of these in the 70’s and some things like keys would stick out. Not one of my favorite bags but it was cute and unusual. Nancy, that is so cool that you had one! I guess this is a nostalgic piece, brought back around. I love that designers do that with some pieces. I could totally see that happening with keys if they weren’t inside a key holder/case. I started putting my keys inside a key case when I bought a nicer purse last year. I was worried about the keys poking into the interior of the bag and into my leather wallet. Cute bag! And priced right! I like the insert you chose. It looks nice with all your dresses. Thanks for the comparison. It’s cute and girly! 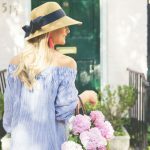 The bag goes so well with all your summer dresses (which I love – they have the prettiest patterns and that easy-breezy summer style.) Isn’t it funny how some small thing like a cute handbag can light up your day? Glad you found the bag – it really does have that nostalgic feel. I’m going to go check it out. I just received mine from Amazon, however, I didn’t see the one with the insert. Mine looks just like yours except that it came with a very pretty, narrow scarf to tie around the handle. 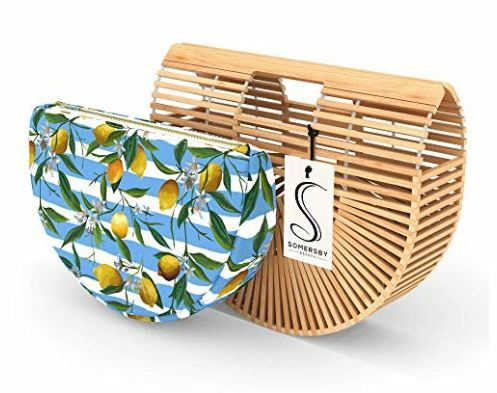 Women’s Tote Bamboo Bag from Covelin, Handmade Top Handle Handbag for Summer Sea with Scarf. I think I am going to love this bag. Very versatile. I love handbags! Oh, Susan. Thanks for sharing this. As I read through the post I was inching closer and closer to buying one. My only hesitation was that my wardrobe did not seem to lean towards either of the two inserts you showed. But imagine my delight to see a third choice. Black, with hummingbirds. I wear a lot of black. And hummingbirds are my favorite. Thanks for the tip! edge through the top slats OR one of your beautiful dinner napkins. You can have so many new ideas with you new bag. It will certainly bring you joy. Haha, I loved the story about carting Barbie to the beach in one; that’s got to be a unique memory. Maybe Etsy has a source for additional inserts. I love that, too! Sooo cute! I never really understood the allure of this bag, as one can see right into them, and small objects would fall out. 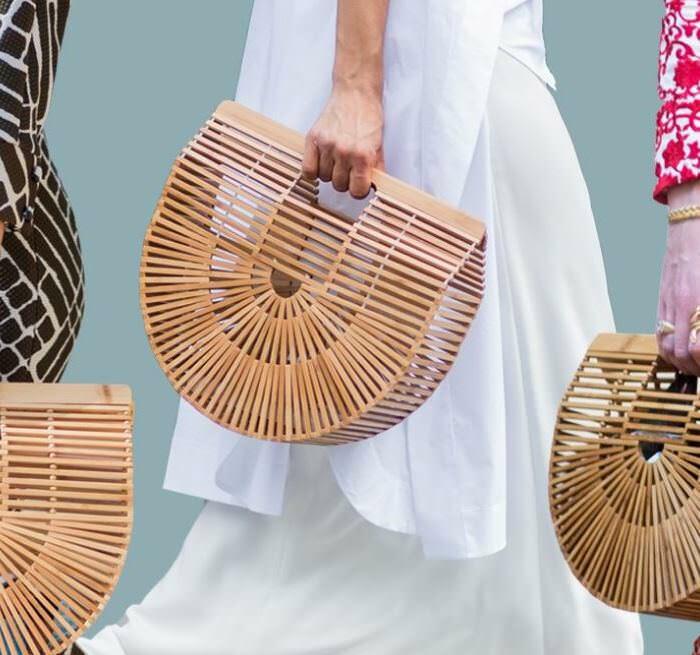 Then, being the fashion victim that I am, Cult Gaia came out with their Stella large round bag – a jumbo size bag made of woven rattan – which I fell in love with. Of course, I capitulated, bought the bag, vowing I would line it with fabric. Well, needless to say, I have not yet found the right fabric, which has kept me from using it! (Indecision is my worst fault.) But I still love the bag! lol I totally understand. I didn’t think I’d ever want this bag but I couldn’t resist the price at Amazon and now I love it! I think it’s the symmetry of the bag that has really captured my heart. I’m surprised at how little you can through the bag. Even when I put my stuff inside without using the bag insert, I can’t tell what’s in it at all…you just some color. That really surprised me, but I still love using the bag inside of it. I need to check out the Stella round bag, that sounds really cute, too! I don’t carry a purse much but it’s so beautiful I may buy one to keep some craft supplies in-maybe Valdani thread I’m using in a project right now and the insert would help keep the thread from getting caught. Maybe a skein or two of yarn when I’m crocheting or knitting. Beautiful and functional and I can have a pretty purse like other women, even if I don’t use it as a purse. I browsed through the Sponsored products at the bottom….I know you love pink-did you see the pink one? I’ve decided to order the one you got but I do love hummingbirds so that’s the insert I’ll be getting. No, I missed that! I need to look for it, although once the bag is inside, you really hardly see it. Maybe if it were a solid color it would show through a bit more. 🙂 Thanks, Sandra! Oh, wait a minute…you mean the pink Cult Gaia arc bag? I did see that and think it’s adorable. It’s made out of acrylic, I think. I had one back in the 70s. I remember it was very uncomfortable to carry. I had one back in the early 1980s. As others have said, the trend was to line it with a scarf or bandana, with the ends of the scarf pulled through the ends of the bag and tied in a knot (suggestion: avoid using high-end scarves to avoid snagging or otherwise damaging them). I don’t remember sippered interior cases liners being available back then but a cosmetic or pencil case contained things nicely. 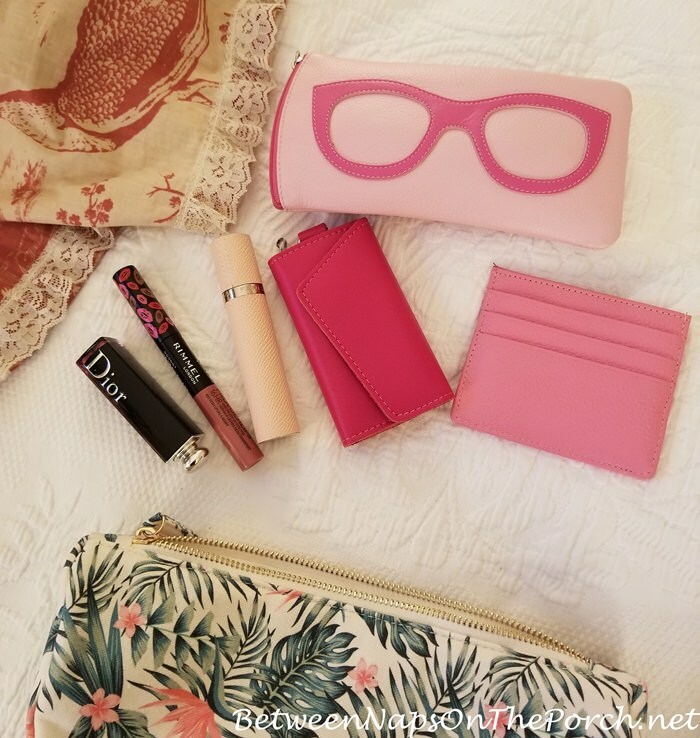 It was a cute bag that I sometimes carried when going to parties or lunch dates, but otherwise I didn’t use it very often — I prefer my hands to be free, so I prefer a shoulder bag or one that I can slip over my wrist. Tucking this under the arm for more than a few minutes isn’t comfortable. It was fun and cute for occasional use though! I wonder if anyone on Etsy makes the inserts? If so, you could have them in different patterns and colors. There are marvelous seamstresses here who could whip them up so inexpensively. Nice find running across that bag on Amazon. Very cute bag Susan, but I’m curious what type of closure does it have? 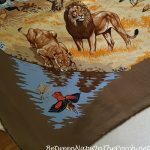 As for its insert/liner, I think even a novice sewer could whip one up if they wished to and/or could be a no-sew project with the right supplies. All said; where I live (Canada) you are hard pressed to even find a ‘summer’ bag ( with the exception of something for the beach) that isn’t made out of anything but leather or canvas (or a combo of the two) so having one like this would definitely be unique since those of straw/rattan/raffia are also pretty well obsolete. To conclude; as selection is so sparse, I have even purchased more than one in my favourite style (in a neutral colour), then re-dyed them myself so they will match a summer wardrobe and have done the same for shoes/sandals as well out of desperation … lol! APOLOGIZING FOR BEING SO LONG WINDED. You are so creative! If I tried to dye something, I bet it would be a disaster. lol One thing about the lining that came with this bag is it’s super padded, way more padded than probably necessary, so it’s definitely more than just a lining, plus it feels/looks waterproof. So if something leaks inside the bag, I think it would contain it. It’s a pretty impressive bag! The padding actually takes up a little space in the bag, but it definitely cushions your things inside the bag. The closure is really just the springiness (or whatever you call it) of the handles coming together. They naturally close together and then when you carry it, your hand keeps it closed, as well. Brenda, you’re amazing! You should be a designer and design your own products with our creative you are! Thank you for the vote of confidence Susan, however many of the projects I’ve done have consisted of trial and error. Much of the latter to be exact … ☺. With respect to the bag insert, I didn’t realize it came with the purse as I thought you had to order it separately, so it is definitely a plus from your description. Wishing you a beautiful day. I love the artistic flair of some of the older handbags like this one – so interesting that some of these come back around. I love the inserts. And the fact that you found one just as nice for less makes it so much more appealing! Great find! My aunt had one of these back in the day! I loved hers and wanted one but it was too big for me at the time. I was only a kid and by the time I was old enough, I had forgotten all about them. I just ordered one from Amazon. Thank you so much for posting this. Brought back a great memory for me! I would not pay the price for the Cult Gaia bag though. I don’t think it is worth that much…even with the beads…but will be interested in hearing what you think when you receive it. They also have one on Amazon with the beads. It’s an acrylic bag that comes in various colors which looks very much like the Cult Gaia acrylic bags. It is $49.99.